EXTREME CAUTION ADVISED: This is by far the strongest LIPO-6 fat burner we have ever released. It’s so strong that you can never take more than one pill. This is an ultra concentrated super powerful one pill only fat burner that is designed to assist your body in rapidly destroying fat deposits. To help ensure that your diet and weight loss goals become a huge success, LIPO-6 Black Ultra Concentrate exerts a powerful appetite suppressing effect. It further ignites an extreme feeling of energy and alertness that will keep you going for hours. 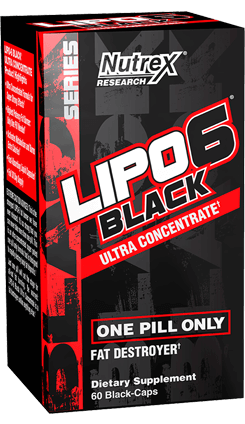 To ensure optimum effects, the powerful ingredients of LIPO-6 Black Ultra Concentrate are embedded in fast-absorbing liquid capsules.